There are a few Bible verses a hymn lyric that have helped me get through this first week without Rommie. All were tied to my daily devotions from Streams in the Desert by L. B. Cowan and edited by Jim Reimann. Here are the verses and how they applied to my life this week. I did not feel strong this week, in fact I felt very weak physically and mentally. However I put one foot in front of the other and moved forward as slowly as a tortoise. Facing challenges means God is growing you, He is developing your character. However, there are days I wish He would quit working on my character. Not was sufficient, not will be sufficient, but IS sufficient today, tomorrow and always. I just kept repeating this over and over this week and found comfort in it. He was there helping me all week, giving me the desire to get out of bed every morning, the strength to get through each day and the rest I need every night. He gave me encouragement to keep on going through my daily devotions and the cards and phone calls from other people. Because that is what He does – He uses people to help people in need. I sung this verse from Amazing Grace over and over again. I also wrote in on a piece of paper I carry in my purse. A simple reminder of God’s promise in this tough time. Hopefully these verses and lyrics will bring you peace today and always. I knew I had to use this song for Sunday Hymnal. I was at a stop light when I thought of it and after driving through the light I caught a glimpse of a yellow-bodied butterfly with black edging fly across my windshield. I also saw the same butterfly on Saturday afternoon while at the cemetery where Joe is buried. 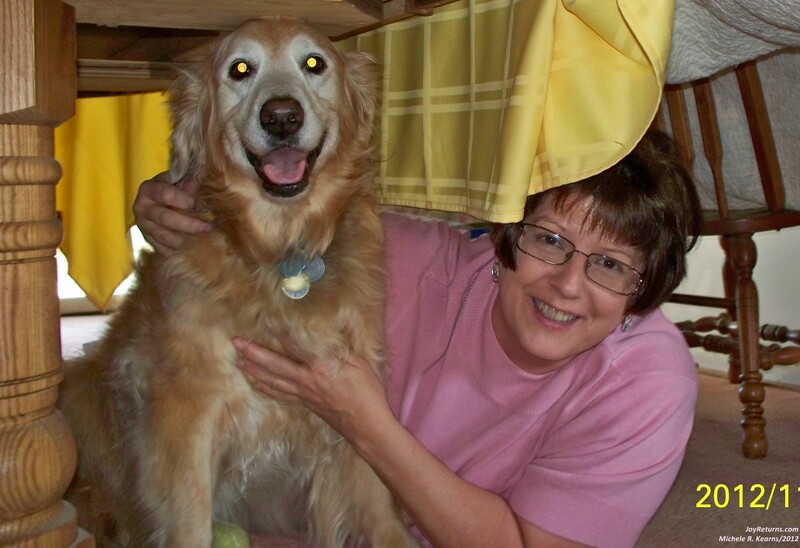 Rommie’s chain was her hip dysplasia and that chain is now gone – forever. 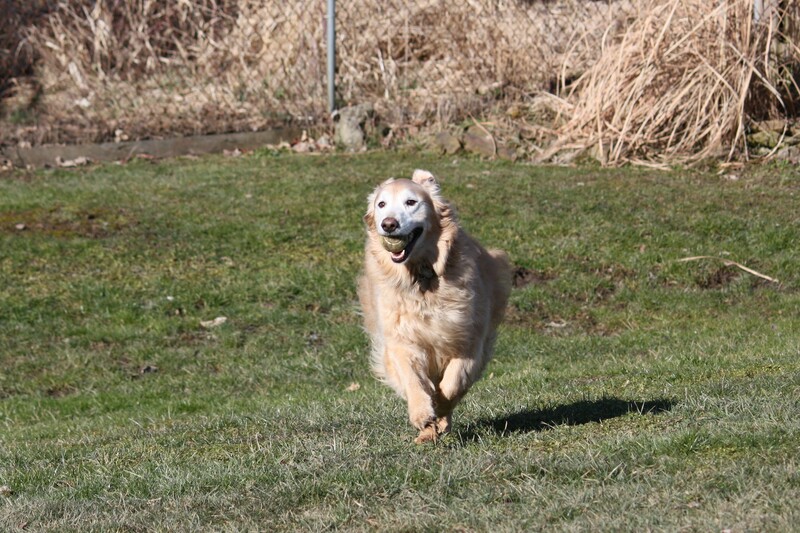 Run free my beloved golden daughter, run free. Hi! 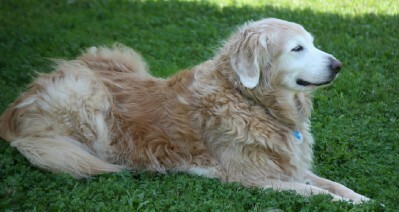 For those of you new to Mom’s blog, my name is Rommie Kearns and I am Mom’s golden retriever daughter. It gives me great pleasure to hack Mom’s computer from time to time and write my own post. Mom told me all about this 31 Days of 5 Minute Freewrite challenge that she joined. She explained that since her blog is JoyReturns that she was going to write about joy for 31 days. 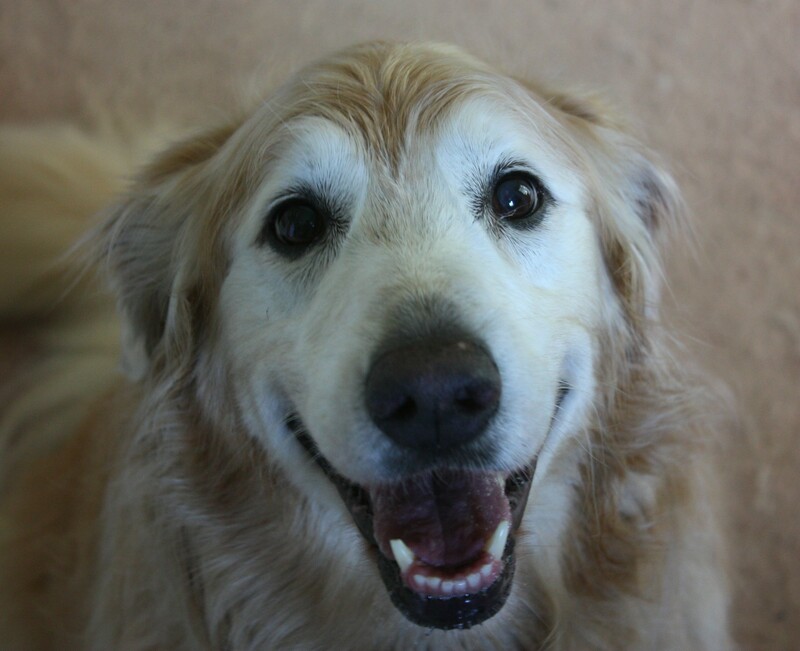 Let me tell you about 12 years of golden joy. 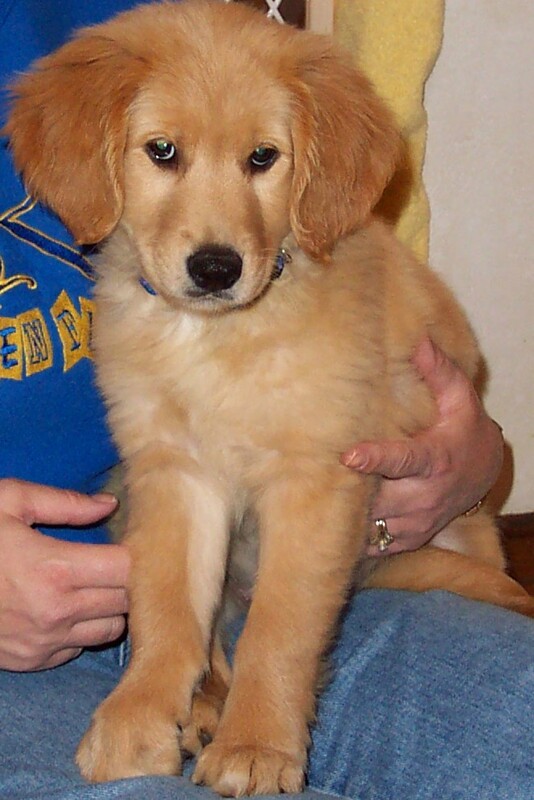 It was 12 years ago on October 14th, that I came to live with Mom and Dad. It was Columbus Day and Mom was off work. She came to pick me up a little after 9 a.m. I was in my kennel waiting for her, the owners separated me from my 7 other sisters. My 1 brother already found a home. I was excited when Mom picked me up. I bounced around the back seat the short drive to my new home. When Mom let me out of the car, I immediately peed on the driveway. Then she showed me my backyard. I felt blessed because it was so big. Daddy came home from work early and the 3 of us played together. After supper, we went to the basement. It is cool down there. Daddy turned on this big thing and it made lots of noise, there were people on the screen. I was startled when he turned it because of all the noise. We use to spend most nights in the basement watching what they call the TV. Daddy loved his TV shows – especially sci-fi. That was my first day. It was very exciting and tiring. 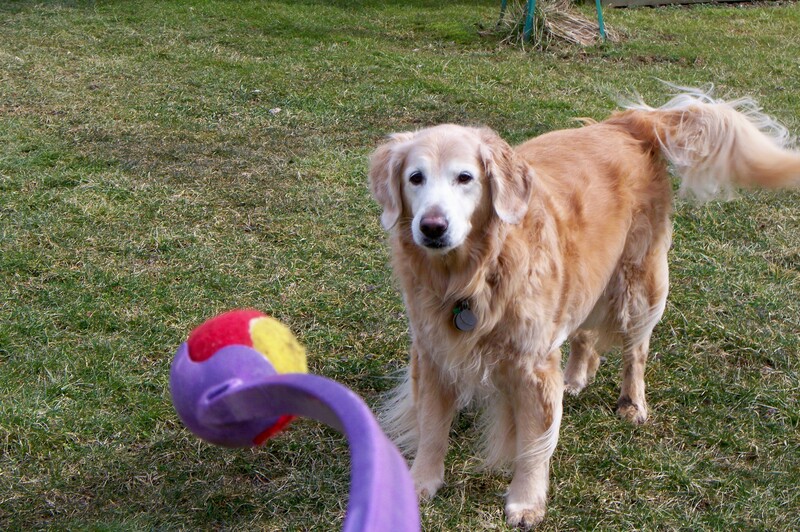 About 2 years later, Mom and Dad joined Golden Retrievers In Need and fostered my cousins, who needed temporary homes, until they found a “furever” family. My first experience being a foster-sister was to “C” & “L” (initials are used for privacy reasons). Yes, Mom and Dad decided to foster a pair. They were suppose to be with us for 2-4 weeks, well it took 7 months to find them a “furever” home. There were several other foster siblings that came and went during the next few years. It was an adventure as I never knew who Mom would bring home from G.R.I.N’s vet partner. Then on day in December 2007, Mom brought home another “C” (a.k.a Ms. Studious). She was very calm and liked to study people. When she first came to us her ears were so badly infected that her ear flaps were swollen. Daddy had to hold her head very still as Mom put salve in her ears. Once they started to heal, Ms. Studious was better behaved when it came time to give her medicine. The bad thing about Ms. Studious is she barked at trucks going down the street. She did not like the loud noise they made. Even when the snow plow would come down at 2 a.m. she would run down the hallway barking at it. After she got well, we had people over to see if they would be interested in adopting her. But the couples had dogs that were high energy and Ms. Studious was very mellow and was never a match for potential families. Daddy petted Ms. Studious and me and then we got put into the spare bedroom. Mom called 911 and several men came to our house. We could hear them but were not allowed out to play with them. After they took Daddy, Mom opened the door and let us out. We jumped on the couch and saw the men in blue put Daddy into this big red truck, with flashy lights. I never saw my Daddy alive again. A couple weeks later after Daddy made it through his surgery, blood vessels broke in his brain while he was in rehab. God healed him by taking him to heaven. Mom has had her ups and downs since Daddy passed. Including losing her job at the bank one year later. 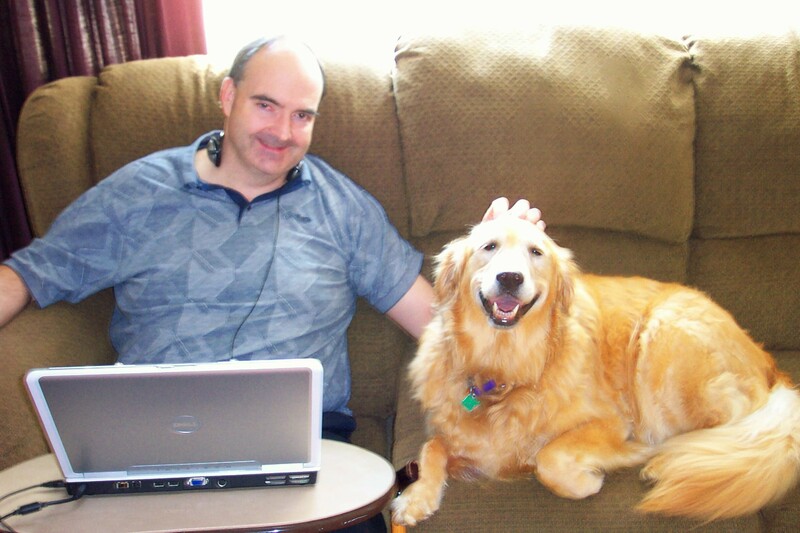 Ms. Studious found her “furever” home 6 weeks after Daddy moved to heaven. I am sure glad she was with me during all the chaos. She kept me company when Mom was at work and at the hospital. Mom has said I am the reason she got out of bed that first year. She did not want me to go potty in the house. Mom got back into photography and reading books. She’s learned blogging and all forms of social media. She picked up her computer skills from Daddy. We’ve had lots of fun together. 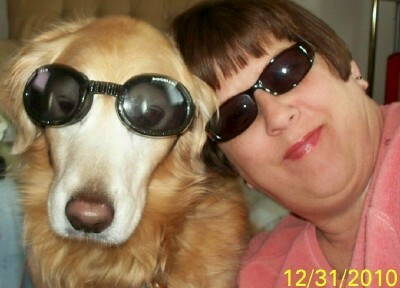 Mom thought that self portrait was fun. So she decided to make it a yearly event. However, I’ve not cooperated. Here’s us playing “tent” like Mom and Auntie “N” did when they were kids. 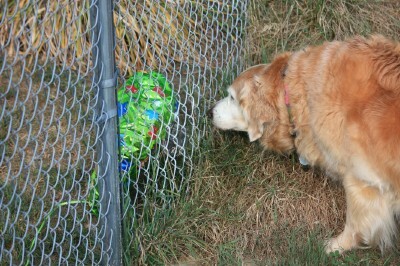 Here I am investigating an alien landing in my neighbor’s yard. It’s been a wild and crazy 12 years. I’ve learned all about tennis balls, how to be a watchdog and retrieve dirty clothes from the basement. I’ve been blessed with grandparents, aunt’s, uncle’s, cousin’s and neighbor’s, including my BFF – a beagle. Most importantly, Mom and I thank God for our time together. I see God in her and she sees God in me and that brings us joy. 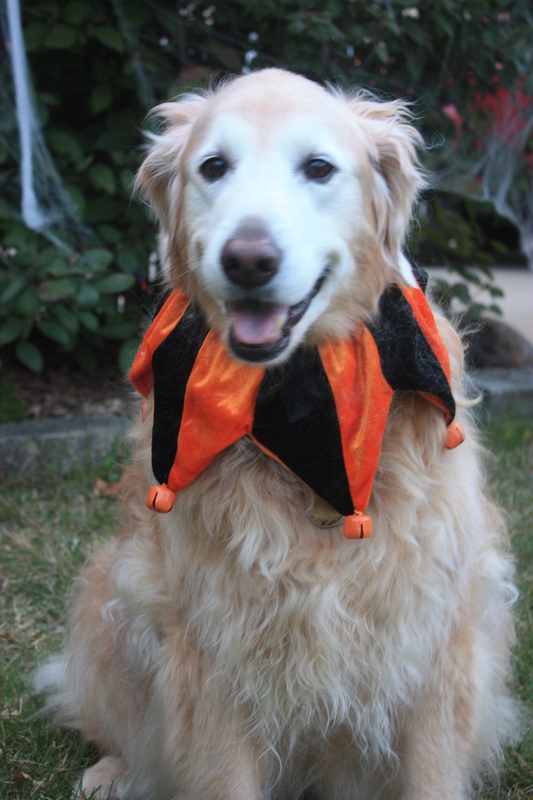 The wonderful thing about this time of year is Rommie (golden retriever) gets cold at night. When she does she jumps into bed with me, well she use to jump into bed. Because of her hip dysplasia, she puts her 2 front paws up on the bed and I lift her rear end up. Unfortunately, my master bedroom is too small for a ramp or steps for the bed. It reminded me of times when Joe, Rommie and I would take a Saturday or Sunday afternoon siesta. The 3 of us laying on our bed drifting off to sleep. It was during those few moments before sleep overtook me that I would lay there thanking God for the special moment and thinking now THIS is heaven on earth! There was such a deep, joyful peace in my heart as the sandman knocked me out. It was those warm, sweet memories that came flooding back last night as Rommie snuggled with me – for about 20 minutes then decided she was too warm. The hardwood floor was more comfortable. Oh well, the weather is only going to get colder and that means there will be nights when she will sleep with me all night. 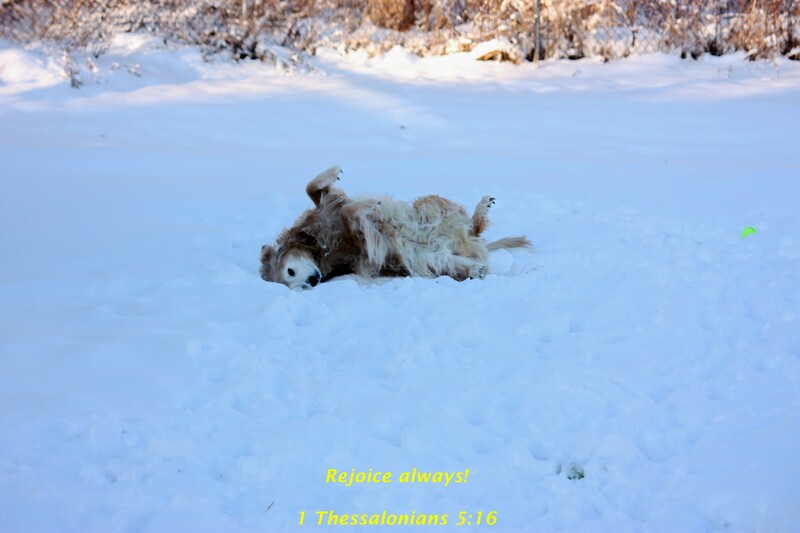 Another round of snow – what joy! The official storm warning does not take effect until 8 p.m. Eastern but it is already snowing tiny flakes. Parking bans are in effect in some cities and the roads are pre-treated with salt. Snow plows are ready to go – again. Most likely schools will be closed on Wednesday – again. Maybe we get 4 inches but most likely somewhere between 10 – 13 inches. Then we get to do this again on Sunday/Monday when yet another storm comes calling. 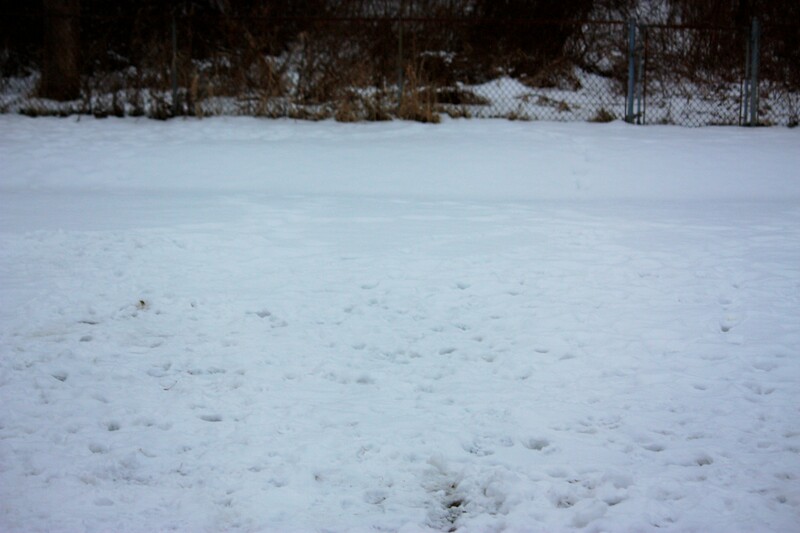 Rommie has the snow from previous storms packed down and is anxiously awaiting some fresh power in which to romp around. I love snow days when I can just stay home and curl up under the covers with a good book. However, this is getting ridiculous. Even I, the introvert, am getting cabin fever. I need to be attending networking events and having lunch with different contacts in order to find a job. Stay tuned as there may possibly be more pictures from this most recent storm.